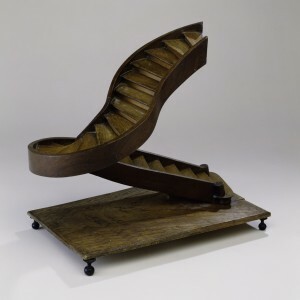 Recently, a friend brought to our attention the amazing collection of staircase models at the Cooper Hewitt in New York. These wooden steps, spirals and banisters are from the mid-18th century through the mid-20th century. They measure everywhere from just under 4 feet to only a foot in height. And they are astounding. The staircases come from the private holdings of Eugene V. and Clare E. Thaw, and now reside within the museum’s Product Design and Decorative Arts collection. The online gallery showcases “20 objects of this type.” “People love those freaking tiny staircases,” said Katie Shelley, a film and multimedia producer for the museum. We just can’t help it, Katie. The group went on display in 2006-2007 in Made to Scale: Staircase Masterpieces and we’d happily line up in the dead of a New York winter to see them again.